Ti. 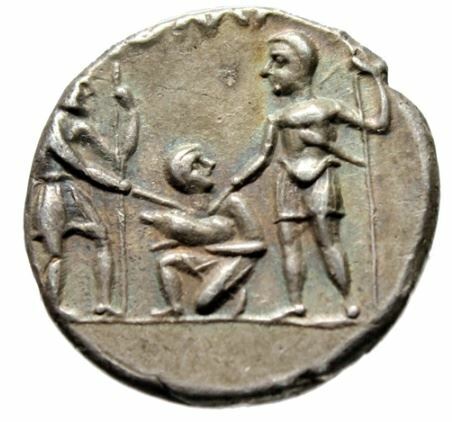 Veturius Gracchi was one of the moneyers for the year 137 BC. He is not otherwise known. Gens Veturia, originally Vetusia, was an ancient patrician family of the Roman Republic. According to tradition, the armourer Mamurius Veturius lived in the time of Numa Pompilius, and made the sacred ancilia. The Veturii occur regularly in the consular fasti of the early Republic, with Gaius Veturius Geminus Cicurinus holding the consulship in 499 BC. Like other old patrician gentes, the Veturii also developed plebeian branches. The family faded into obscurity in the later Republic, with the last consular Veturius holding office in 206 BC, during the Second Punic War. The nomen Veturius belongs to a class of gentilicia in which the old, medial 's' has been replaced by 'r', as in Valesius, Fusius, Papisius, and Numesius, which in later times were Valerius, Furius, Papirius, and Numerius.